The new security gate upstream had been installed, and the downstream gate was expected early next week. Although we didn’t know it, Friday, Saturday and Sunday was the Head of the Hootch, a rowing competition with 1500 launches. High school, college and other teams competed against one another. We were able to see practices on the days we were there. the art district with restaurants, galleries and gardens, and many fine restaurants. It was a treat to eat out for several lunches, dinners and one breakfast. We joined Jerry and Jenny and their friends Jeff and Susie Parker one day for lunch. Jeff is on the Board of Directors for the Aquarium. They have also completed the loop AND climbed Mt. Everest. One of their local contributions was to carve & paint a carousel horse for the indoor Chattanooga carousel. The riverfront is spectacular. It’s too bad that Peoria didn’t consider something similar. There is a water cannon and tiered concrete seating which form a natural stadium. Walking paths abound. There is a pedestrian bridge in addition to several auto bridges. Art work is built into the walls and the brickwork pathways, detailing the history of the city. We found a bookstore / yarn store that resembled the old Fourteenth Street Hardware store in Pekin. Clutter everywhere! And it was run by an eccentric weaver/ knitter. She gave me a brief lesson and I left the store loaded with yarn. No wait at the Chickamauga Lock. We wound our way back to this harbor under an 18 foot bridge. $25 a night—doesn’t matter what size the boat. The restaurant here was packed and we had to wait, but it was worth it. 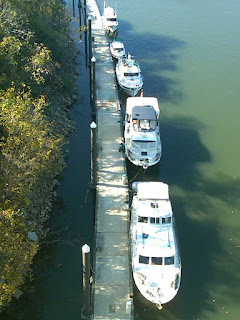 11/5-destination is the Hiwassee River, B & B Marina. After staying there, this marina is NOT recommended. They charged $30 to tie up to a very rickety dock....no amenities except a portapotty. Dogs owners had not cleaned up after their pets on the docks or in the parking lot. We had dinner on Sweetgrass for the last time. Jenny and Jerry are heading toward Knoxville and the Vanderbilt football game. We are reversing our course and heading downriver to Chattanooga. 11/6 After waiting for the fog to clear, we traveled a few miles with Sweetgrass and said our goodbyes. We arrived at the Chickamauga Lock just as a downbound barge did, so we anchored and had lunch. After about an hour, we called the lock and the lockmaster told us to hurry toward the lock wall and wait for the lock to fill. The tow, Bearcat, had dropped two barges below the lock and was going back for the rest of his load. We were the only craft to get through. All of the other boats below the lock were told it would be 1 1/2 to 2 hours before they could lock through. We arrived at the same dock in Chattanooga and found a spot between two boats. Everyone else had departed after the rowing contests.